Found one file extension association related to World Machine and 1 file format developed specifically for use with World Machine. For Nature, it takes millions of years. For you, seconds. World Machine begins as a blank canvas. Onto this canvas you drop devices which define terrain actions and connect them into a network. 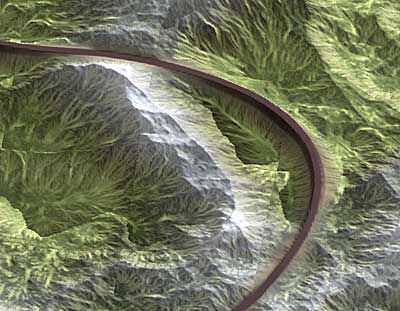 This network defines whether your land looks like terraced canyons, rugged eroded mountains, or barren moonscapes. The possibilities are endless. Once you've begun building your network you can get a look around in several different views. Enter explorer mode and drop into a first-person view of your world, extending infinitely in all directions, never repeating exactly. Don't like Nature? Excavate it! When you find an area within your world that looks good, you more than likely want to make some custom changes... Make that mountain taller, add a river over there. This is all accomplished in layout mode which lets you draw in custom shapes and apply masks where you want them to your terrain effects. I've made my world, now what? Once you've crafted your world, it's ready to build at a high resolution and export for you to use in the 3D rendering software of your choice. World Machine also offers advanced tools to create sophisticated texture maps based upon the erosion and other details of your terrain. This provides a great way to get basic groundcover texture into your application. If you need more information please contact the developers of World Machine (Stephen Schmitt), or check out their product website.